In the broader context of the Arab world, Morocco has one particularly unique feature: Whereas other countries in the region often have two cities of importance (Aleppo and Damascus, Algiers and Oran, Cairo and Alexandria), Morocco has bustling hubs of activity in its four imperial cities: Meknes, Fez, Marrakesh and Rabat, not to mention in its largest city, Casablanca, and the Mediterranean city of Tangier. Today, as protesters step out onto the streets to call for an end to corruption, constitutional reform, and the dissolution of parliament, their strength in numbers is distributed across these cities, as well as in smaller towns. 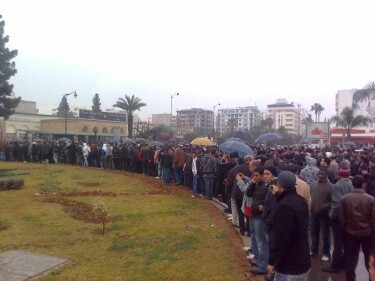 From the capital of Rabat, Omar El Hyani has been sharing images from his Twitpic account. 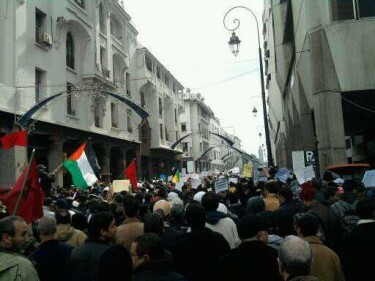 The images show hundreds, perhaps thousands, gathered by the walls of the medina. Selon nos différents reporters sur Casablanca, le nombre des manifestants continuent d’augmenter dans la capitale économique. Au bas mot, ils seraient 9000. Beaucoup comptent y rester toute la journée. 13h00, Fès : 10 000 personnes dans la rue selon les organisateurs. 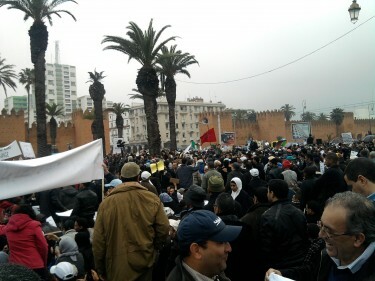 According to our various reporters in Casablanca, the number of protesters continues to increase in the economic capital. At the very least, they are 9,000. Many intend to stay there all day. 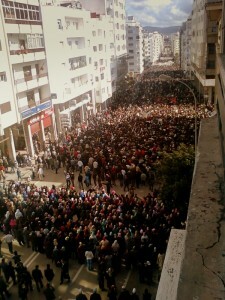 13:00, Fez: 10,000 people on the street according to organizers. It is worth noting that Meknes has a large military presence, which could account for the low turnout. The ancient city of Fes is perhaps better known for its tourism than anything else, though as the home of the university of Al Karouaine, it is also the spiritual core of the country. A video posted on Facebook by Ilyas Fadili shows the size of the crowd as well. Il y a un principe legal qui stipule que tout droit impose une responsabilite . 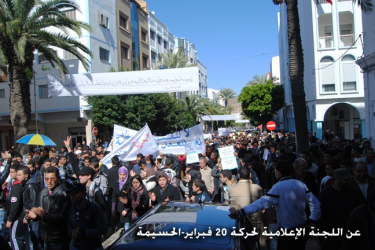 The regime will stoop to any level to discredit the legitimate protests of the Moroccan people and label them as vandals, collaborators, agent of foreign regimes, terrorist, etc….. 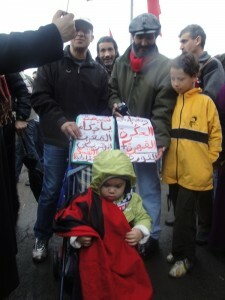 They will not succeed and Morocco will become a free Nation, a Democratic Nation that controls its destiny. Long live free Morocco. If in some Arab countries they sent the thugs to scare the protesters in Morocco they were sent to discredit the movement before it gathers momentum. The security card has passed its sale by date.